Wanna turn your scale focused point and shoot into a rangefinder ? 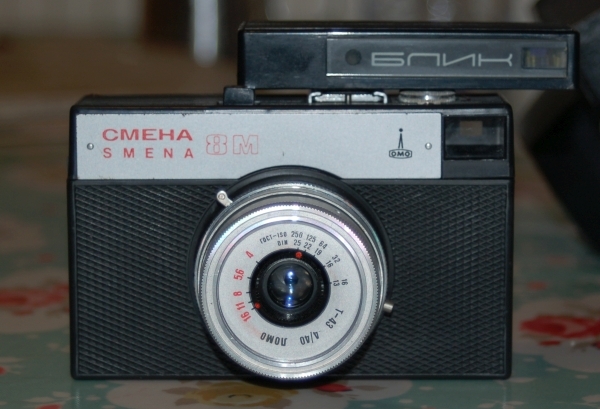 Well an external rangefinder could be for you and good old Lomo produced a decidedly modernist one in the Blik (Блик – meaning ‘Speck of light’). 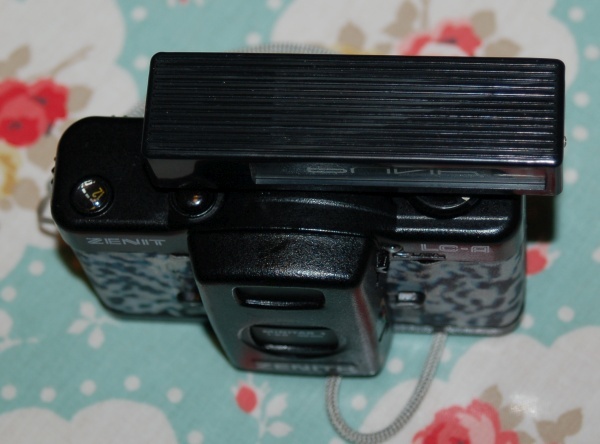 This crafty bit of Soviet engineering slots into any hotshoe or cold shoe camera and gives it rangefinder. You simply look through the viewfinder and turn the dial on the rear until the images in the yellow focus zone line up horizontally and read the distance off the dial. The focus spot is quite bright and contrasty for a rangefinder but worth nothing the viewfinder window is small. The Blik is marked from 1m to 15m then infinity which sound like a reasonable spread ( beyond 15m a concept called hyperfocal distance will mean even at a wide aperture things will be in focus from there to infinity with lens of around 35mm focal length). As we’ll discuss the killer use is at closer distances particularly in low light. This works reasonably well. I found my images didn’t line up on the vertical plane but this wasn’t really an issue. I noticed that it was off a little on the horizontal (focusing at the moon should equal infinity) but luckily you can calibrate the rangefinder (the screws to do so are under the flash holder but do so carefully and I’m no expert so won’t tell you how but if you google it you’ll find some who think they know). Mines now lines up accurately and have measured it off versus my Ricoh SLR. The design is certainly late USSR as a black plastic modernist box about the size of a cigarette lighter. It comes in a black plastic case with lug points that allow you to slide it onto most camera case straps. There are a couple of points to consider however. The first one relates to the design of the Blik. 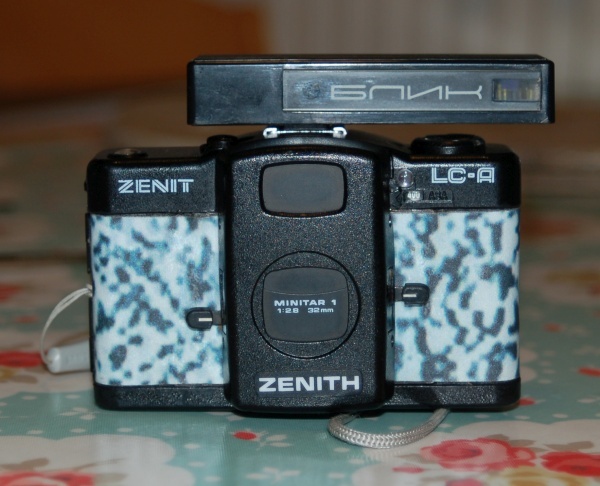 Its box like shape means it can obscure the shutter on some cameras like the LC-A (not that you would want to use it with one). The second (and this is more general to all external rangefinders) is do you really need one ? If this is such an issue for you why not a coupled rangefinder available in every hue and price range from Leica to Haminex or a SLR or TLR. with all of those you focus the camera at the same time. If you wanna use a viewfinder isn’t this missing the point and challenge in most conditions ( in low light however when you are shooting with the aperture wide open this might be more handy for closer focus) ? I certainly wouldn’t use with a zone focus model. Whilst I review Lomo’s later one here there are a range of these available from different manufactures (Lomo did an earlier smena one too I believe). The Blik is a nice small pocketable model that if you want a rangefinder you might want to consider. Expect to pay one side or another of a tenner for one. Reliability has been hailed as an issue by some but other love ’em. I was recently given a Blik rangefinder and find it the best I have ever used by some margin. The coincident images are strong and clear and the adjustment wheel very precise. The downside is that it is calibrated in metres which requires conversion if your lens is calibrated in feet. Considering its very reasonable price I recommend it wholeheartedly.